To be “full of audacity” is to be daring and reckless; it means to cross frontiers which others consider insurmountable. Take out the “a” and you have what DLDster Sebatian Thrun believes can change the world – Udacity. As one of the first and most far-reaching higher education providers on the internet, Udacity offers online courses by real university professors for free. The courses have become known as MOOC’s – massive open online courses. 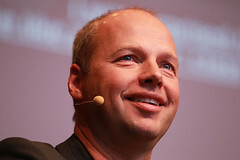 “Maybe we have to rethink education”, said Sebastian Thrun in 2012 at DLD in Munich. He believes that higher education as we know it hinders people from learning. “I started to realize that grades are the failure of the education system.” The experience of teaching via MOOC’s shifted his aim from challenging students to helping them achieve. On the Udacity website it says “the lecture is dead” and that “bite sized videos make learning fun”. The idea of introducing fun and creative ways of teaching, to support the students is still a relatively new concept. Classroom architecture and behavior have changed only marginally in the last hundred years. An exception in this is Finland, which has taken a radically different route in education. The country’s education system was the surprise star of the last Pisa survey (conducted by the OECD), which showed that Finnish students score highest in skills like math and grammar. One reason cited for Finland’s positive results in education is that equality is valued more than excellence. Finland sees education as a social lever to eradicate inequality rather than using schools to train elites. The by-product of nurturing an inclusive and creative environment is that Finnish students achieve higher marks than their counterparts in other countries. Although higher education may be a slightly different ball game, the key to Udacity’s prolonged success may lie in a lesson from Finland’s education system – valuing equality more than excellence. At DLD12 Thrun already mentioned one way in which MOOC’s offer more equality than the traditional setting of lectures. Women are rare in the computer science classes but online they feel more protected and respected, which results in proportionally more women in computer science MOOC’s than physical lecture theatres. If you spin the yarn of enthusiasm about online learning even further, MOOC’s have the power to make society more equal on a global level and beyond different age groups. The courses are free and accessible to anyone with an internet connection, meaning that professors like Sebastian Thrun from Stanford University can teach people anywhere between Shanghai, Lagos and Mexico City, whether they are 17 or 70 years old.